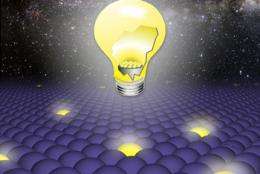 Artists conception of how solving the problem of quantum blinking may lead to applications in areas such as solid state lighting. (PhysOrg.com) -- Research by Los Alamos scientists published today in the journal Nature documents significant progress in understanding the phenomenon of quantum-dot blinking. Their findings should enhance the ability of biologists to track single particles, enable technologists to create novel light-emitting diodes and single-photon sources, and boost efforts of energy researchers to develop new types of highly efficient solar cells. Most exciting is that the Los Alamos researchers have shown that blinking can be controlled and even completely suppressed electrochemically. As the Nature article describes, the group developed a novel spectro-electrochemical experiment that allowed them to controllably charge and discharge a single quantum dot while monitoring its blinking behavior. These experiments facilitated the discovery of two distinct blinking mechanisms. "Our work is an important step in the development of nanostructures with stable, blinking-free properties for applications from light-emitting diodes and single-photon sources to solar cells," said Victor Klimov, LANL scientist and director of the Center for Advanced Solar Photophysics (CASP). Quantum dots are particles between 1 and 10 nanometers in diameter. A nanometer is only one billionth of a meter across, or about 1/3000th the diameter of a human hair. At these tiny dimensions, the rules of quantum physics allow scientists to produce particles with finely tunable, size-dependent electronic and optical properties. Together with the fact that they can be fabricated by means of facile wet-chemistry techniques, their quantum nature makes these dots attractive materials for a wide range of applications. Nanocrystal quantum dots have been on the research scene for decades. The color they produce when excited by light absorption or electrical current can be precisely tuned from the infrared through the visible to the ultraviolet spectra, and they are cheap and easy to make. Set against these advantages is a drawback—quantum-dot optical properties can randomly vary over time. Perhaps, the most dramatic manifestation of this variation is quantum-dot "blinking." Additionally, if energized by electrical current or light, they are characterized by an effect known as Auger recombination that both competes with light emission in light-emitting diodes and reduces current output in solar cells. Both blinking and Auger recombination reduce the efficiency of quantum dots, and controlling them has been the focus of intense research. To probe the mechanism responsible for blinking, Christophe Galland, postdoctoral researcher in CASP, along with collaborators from the Center for Integrated Nanotechnologies (CINT) and CASP developed a novel spectro-electrochemical experiment that allowed them to controllably charge and discharge a single quantum dot while monitoring its blinking behavior. It is this work that is described in the Nature article. Its main result is the discovery of two distinct blinking mechanisms. The first is consistent with the traditional concept of quantum-dot blinking, that is, the random electrical charging and discharging of the core of the dot. In this model, a charged state is "dark" due to highly efficient nonradiative Auger recombination. The second mechanism was a surprise; the majority of quantum dots blink due to the filling and emptying of a surface defect "trap" on the dot. If not occupied, this trap intercepts a "hot" electron that would otherwise produce photon emission, thus causing a blink. With further research into the photophysical properties of quantum dots, the scientists hope to provide a comprehensive theoretical model of this phenomenon. "The new single nanocrystal spectro-electrochemistry technique developed here could readily be extended to study the effect of charging in a wide array of nanostructures, including carbon nanotubes and nanowires," said Han Htoon, a CINT staff scientist who took part in the research. "I believe that it will become an important new capability for CINT." Experiments were conducted at CINT, a U.S. Department of Energy Office of Science User Facility and Nanoscale Science Research Center. Its emphasis is on exploring the path from scientific discovery to the integration of nanostructures into the micro and macro worlds. Hmm, I had a simular kenetic force problem with the 2012 NIST SI Plank Units system of equations balancing... Every vector except tempature (Kenetic) reduced to 1 as expected. IS there a property of kenitics which effects atomicly bound and unbound conditions? I still have the idea about blinking is due to 'Q' loss in efficency in the thermal area.